Why did the Joker take the risk of placing a gun in Harvey Dent's hand? After Harvey Dent's face got burned and his fiancée was killed in The Dark Knight, the Joker goes to the hospital and gives Harvey Dent a gun to give Dent an opportunity to kill the Joker. Why was The Joker so sure that Harvey would not pull the trigger? Is there a chance that gun was indeed empty? The Joker seems to be a lunatic; however, as far as the plan goes, he seems to be one step ahead of others (irrespective of saying that he is not a man having a plan). In the above scenario, if Harvey pulls the trigger, not only does the Joker die, all his other plans would have failed. The Joker really didn't care about death at any point even if Harvey pulled that trigger then. The biggest example for that is during the scene when he falls of the building during the fight with Batman even when he is falling, he laughs hysterically before Batman catches him with grapple gun. Harvey Dent was Joker's biggest ace. When he gave him the gun he took the gamble, had Harvey blown Joker's brain then the Joker wouldn't have cared about his death but he surely would've had the last laugh because he took the symbol (white knight) of the city and drove him to insanity and made him a killer. The Joker's primary ambition was to make Batman do that but Batman was completely incorruptible so he resorted to the next best person in Gotham city which happened to be Harvey Dent. Even Joker openly admits that in the above mentioned scene to batman. Joker: Until their spirit breaks completely. Until they get a good look at the real Harvey Dent, huh? And all the heroic things he's done. You didn't think I'd risk losing the battle for Gotham's soul in a fist-fight with you? No, you need an ace in the hole; mine's Harvey. I have been thinking about this question furthermore. I believe the only reason Joker walked out of the room alive in the hospital scene with Harvey Dent was because the coin toss favored him. As we learn later in further scenes Harvey only shot the people whom the coin toss didn't favor which included Batman as well. When Harvey holds the Joker at gunpoint in the hospital scene, you can see that the Joker is actually holding the revolver’s hammer with his finger, thus preventing the shot in case Harvey's coin lands on “bad” side. The Joker is insane - that is his defining characteristic. Remember when Batman knocked him off the building? As he plummeted to his presumable death, he was laughing hysterically. He was genuinely bummed out when Batman caught him with his grappling gun and saved him. He was also clearly enjoying the beating Batman gave him in the interrogation room. 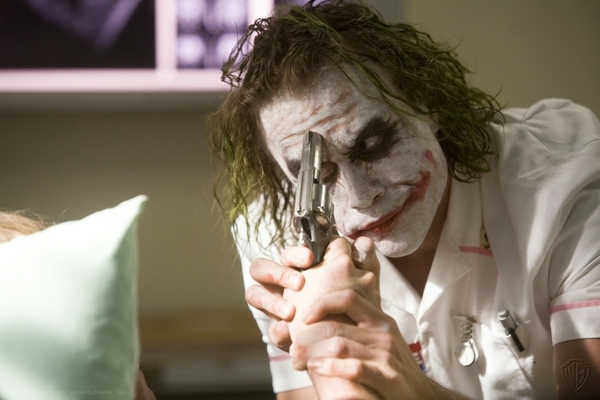 The thing that made Ledger's performance so great was that he perfectly captured the depths of the Joker's insanity, better than anyone before him ever had. The Joker just wants to create havoc and carnage, and whether the carnage involves his own death is irrelevant to him. He may have been relatively confident that Harvey wouldn't shoot him, but we have no way of knowing for sure. Personally, having grown up reading Batman comics and knowing the Joker pretty well, I believe he just didn't care whether Harvey shot him. Watch the video - when the Joker thinks he is about to die, he thinks it is hilarious; when he realizes he isn't going to die, he is annoyed to say the least. The Joker walks towards the Bat-pod, which SPEEDS towards him. He is FIRING his gun RANDOMLY at the oncoming traffic. THE JOKER: "Hit me. Come on. Hit me." Batman watches as the Joker holds out his arms. Waiting for impact. There is no room to go around him. Batman LOCKS UP THE BRAKES. The Joker watches as Batman DUMPS the bike, rather than Smashing into him. Batman SLAMS into the wall. Because he's the Joker and he's a bit of a whackjob? Seriously though - he was giving Harvey the opportunity to kill him while simultaneously manipulating him and twisting his anger to turn it onto Batman and Gotham city. By giving him the gun, he was giving Harvey the power to kill him as it was then his choice not to pull the trigger. Well, the way I see it is that the Joker twisted with Harvey's mind and corrupted him. I believe he didn't necessarily have a death wish, but he wanted to show to the people of Gotham that there are no good guys by any means necessary. He turned Harvey into, more or less, a monster with some mind tricks and putting the blame of Rachel's death on Batman and Gotham, which made Harvey hate them. The Joker also knew the only way to knock the image of Batman off the pedestal of good was to make him break his one rule of not killing, which in the end of The Dark Knight finally happened when he killed Harvey. All this goes much farther. Joker never ever have any regard for his own life, and that is what makes him the Joker. His plan will be complete when he becomes able to corrupt the Batman making him kill him, because then, he would be just like him. Its the eternal Batman X Joker relationship. 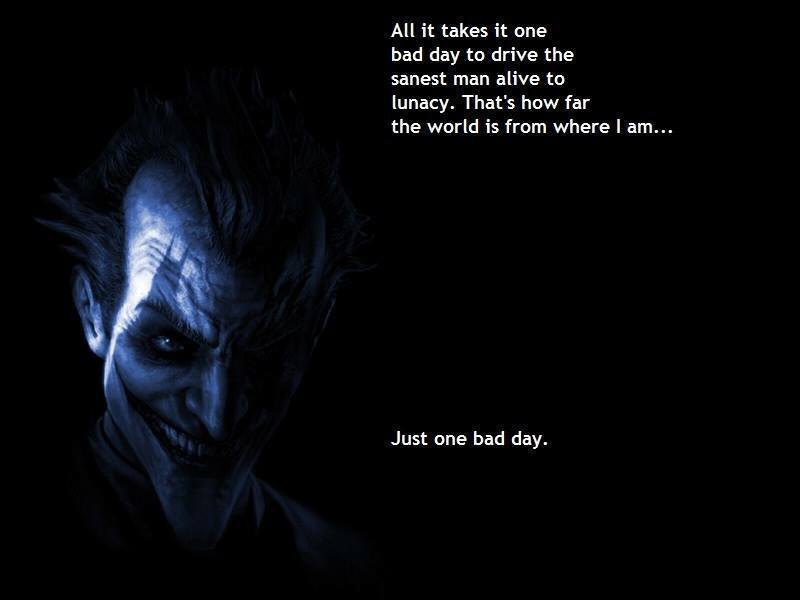 Joker's only goal is to prove that what differentiates him from everyone else is a single bad day, which he says that it is what made Bruce Wayne into Batman. He does not care if he lives or he dies, because in his vision, if he gets a symbol of Gotham (Harvey Dent or Batman) to kill him, he wins. Not the answer you're looking for? Browse other questions tagged character the-dark-knight . Why does the Joker always use a knife? Why did the Joker lick his lips? What did the Joker want to prove in The Dark Knight? Why did the Joker choose Harvey Dent? How did the Joker plant bombs in the hospital? Why did the Joker rob the bank? How did the Joker time the Rachel explosion so precisely?